Before spending your hard-earned dollars on a water filtration system, you should begin by knowing exactly what is in your water that may be harmful to your health and the health of your loved ones. Once specific contaminants and their levels of concentration are identified, you can then evaluate the best water filtration system to use to remove those contaminants. If you are unsure of what’s in your water, there are a few steps you can take. The place to begin is with your local water supplier. Federal law requires that they issue an annual Water Quality Report. If the water provider cannot supply this information, Water2Drink.com recommends that you have your water tested prior to purchasing any water filtration system. Just as the water filtration system you purchase should be certified by a nationally recognized certification organization like NSF, the public health and safety organization, the Environmental Protection Agency (EPA) recommends that you select a water testing laboratory that is certified by your state. You can call the state certification officer, or click over to the EPA’s website at http://water.epa.gov/scitech/drinkingwater/labcert/statecertification.cfm to identify a certified laboratory. Taking the time to have your water analyzed will give you the information you need to make a thorough, educated decision about water filtration. Water2Drink.com provides links to Multipure Product Performance Data sheets, so our customers can directly compare Multipure’s NSF-certified performance levels to their water report. Have You Heard About the “Drink Up” Campaign? Beyond the scope of the Affordable Health Care Act, and whether or not you take part in the American political process, your good health is of interest to our highest elected leaders. Recently, First Lady Michelle Obama joined the Partnership for a Healthier America (PHA) to encourage all Americans to lead healthier lives by choosing to drink more water. By increasing your water intake by just one glass a day, you will improve “your health, your energy, and the way you feel,” says Mrs. Obama. Want to know more about the #FirstLady and PHA’s partnership? Look right here: http://www.whitehouse.gov/the-press-office/2013/09/12/first-lady-michelle-obama-ask-everyone-drink-more-water. The PHA will place the Drink Up logo on bottled water, reusable bottles, and public taps in the next few years. Look for the logo! You can find more information on the “You Are What You Drink” campaign here: http://ahealthieramerica.org/our-partners/you-are-what-you-drink/. It’s as easy as one more glass of Multipure filtered water. Drink Up! Hydration and Health – Why Care? Have you ever wondered why your trainer, exercise instructor, or physician reminds you incessantly to “drink more water!” after a workout or physical activity? It’s not just to replace the fluids that are used during the activity. It’s also to prevent loss of endurance, combat increased fatigue, prevent disruptions in cognition, and minimize other physiological effects of dehydration. If left to hydrate according to thirst, many individuals may not adequately intake enough fluids to offset the deficit of a workout. Mild to moderate dehydration may persist for hours after the activity or workout is finished. It’s recommended that athletic activity begins from a well hydrated state, and that the individual continues to drink fluids above and beyond thirst recognition. Water2Drink.com recommends you read a National Institutes of Health article titled “Water, Hydration and Health,” which gives specifics on this topic, in addition to many others regarding proper hydration. The whole article is interesting, but specifically see Section II, Physiological Effects of Dehydration. You can find the NIH article at http://www.ncbi.nlm.nih.gov/pmc/articles/PMC2908954/ . Can you think of 5 good reasons to drink more water? Fresh, clean drinking water is essential to life. It sounds intuitive, but many people are chronically dehydrated. And most people are not aware of all the things water can do to promote good health. A recent article published by ABC News highlighted important reasons to drink more water in "5 Health Reasons to Stay Hydrated." For more information an health and water, visit Water2Drink.com's Health Information section. Have you ever been in a situation where the water supply to your home has been interrupted? Many people have experienced such a problem when a major storm disrupted their local water utility. Generally, the news services provide a warning that a potentially disruptive weather event is coming your way, but sometimes there is no warning. What will you do if this happens to you? Just one real example of such an event occurred in Maryland on December 23, 2008 with no apparent warning. A massive 66-inch water pipe broke in the affluent Bethesda area, creating an overwhelming torrent of water that immediately endangered the lives of anyone who happened to be nearby. The outside temperature was in the 20’s and the local rescue teams had to work quickly to extract people from their cars using boats and helicopters. It appears that everyone involved made it out safely. But what about the water supply to all the affected homes and businesses? In this instance, residents were fortunate that the local water authority was able to redirect the water supply and restore service the same day. However, in many instances, an emergency like this one results in a disruption to water delivery that lasts for days. If you have ever been in this situation, you know that even a day without water seems like a lifetime, being unable to flush a toilet or find safe water to drink. Once water service is restored, life can return to normal – almost. Sometimes the disruption creates a breach in the water line that allows contaminants to enter the water supply. Even after the authorities declare the water “safe,” prudent people may want to take extra precautions, like boiling their tap water before consuming it. The Environmental Protection Agency has published guidelines on its public web site that you may find useful regarding how to handle “Emergency Disinfection of Drinking Water” (see http://water.epa.gov/drink/emerprep/emergencydisinfection.cfm). Taking the EPA’s recommendations one big step further, you may want to ensure the quality of your disinfected water by pushing it through a compressed carbon block water filter before drinking it. Multipure International manufacturers excellent filters for this purpose that have a lifetime warranty (see http://www.water2drink.com/products/multipure-drinking-water-filter-systems.asp), and they also offer an emergency hand pump to make the job easier. You can disconnect the input line on your water filter and attach it to the hand pump. Putting the water pump input line into the disinfected water and then applying a bit of elbow grease will produce gallons of clean drinking water that you will be quite pleased with. Please be prepared – it’s an “emergency” because you never know when it may happen to you! 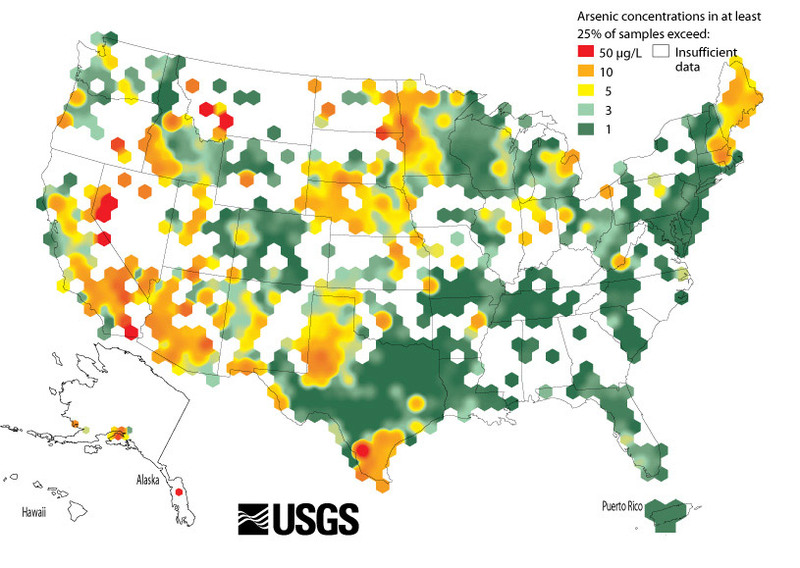 Is There Arsenic Contamination in Your Local Groundwater? Arsenic is a naturally occurring groundwater contaminant that poses dire consequences for public health. The Maximum Contaminant Level (MCL) for arsenic permitted by the US EPA is just 10 parts per billion (ppb), but even that amount may be too much. The EPA requires all public water authorities to regularly test the water supply for arsenic and other contaminants, and send local consumers an annual water quality report with the test results. Do you regularly read yours? Does it list even trace amounts of arsenic? If so, you should consider using an effective drinking water filter to help mitigate the health risk to you and your family. To see if you should be concerned, you can view a map produced by the US Geological Survey showing arsenic concentrations that have been identified across the United States at http://www.water2drink.com/resource-center/health-effects-arsenic-water-contamination.asp. Drinking Water Week is sponsored by the American Water Works Association and the U.S. EPA to help bring needed attention to the nation's drinking water supply system. The United States has one of the safest public drinking water supplies in the world, but there is so much more we need to do. This annual observance serves to educate the public and help consumers learn more about their drinking water. The advent of drinking water disinfection in the early 1900's was a tremendous boon to public health. Overnight it drastically reduced outbreaks of waterborne diseases like typhoid fever, saving the lives of millions of people. You can learn more about Drinking Water Week and public water safety by visiting the Centers for Disease Control and Prevention's website at http://www.cdc.gov/healthywater/observances/dww.html. While disinfection is critical to providing safe drinking water, it's also important that everyone reduce their intake of disinfectants and disinfection byproducts. The best way to accomplish this is to install a high quality Multipure Drinking Water System at the point of use, and use only filtered water for all drinking, cooking, and food preparation. It's easy, it's environmentally sound, and it's affordable. And it's something everyone should do to protect their family's health. Savvy shoppers know that Consumer Reports magazine is a great source for unbiased product reviews and recommendations. So, it should come as no surprise that they have top-ranked Multipure's Aquaversa MP750SB for the undersink drinking water filter category. After reviewing more than 40 of the best drinking water filters on the market, the Multipure MP750SB was awarded the highest category score and listed as 'Recommended'. You can check out the complete water filter product review in Consumer Reports' July 2013 Kitchen Planning & Buying Guide. Many of Multipure's other drinking water filter products offer comparable performance, but the MP750SB model is the most popular and Multipure's best seller. With unequaled performance in reducing contaminants, a Lifetime Warranty on the durable stainless steel housing, and a 90-day money-back satisfaction guarantee, the Aquaversa MP750 series products truly are a great value. For more information on available models, features and product performance, visit www.Water2Drink.com. Why is Your Filtered Water Cloudy? Many people using a high quality point-of-use drinking water filter, such as a Multipure Drinking Water System, are surprised to sometimes see the filtered water looks cloudy. But why is that, if the filter system is so good at removing contaminants? Certain times of the year, but especially when the ground and source water is cold, water flowing from the filter may be almost milky white. It's an interesting fact that one of the many properties of water is its ability to dissolve gases, including air. Colder water is denser than warm water and capable of holding more dissolved gases. Quoting a Water Quality Report from the City of Santa Rosa, CA: "Sometimes the air comes back out of the water in the form of many tiny bubbles, giving the water a temporary milky white appearance. To determine if the white color in the water is due to air, fill a clear glass with water and set it on the counter. Observe the glass of water for two to three minutes. If the white color is due to air, the water will begin to clear at the bottom of the glass first and then gradually clear all the way to the top. This is a natural phenomenon and is completely normal; the water is safe to use." No Real Health Problem? Who Says? Don't you just wonder when you see something clearly is wrong, but the people in charge tell everyone there's nothing to worry about? A recent local news article about an old school in San Bernardino County, California, illustrates the question. In spite of the school's water having an "odd taste and odor," the local health department is telling everyone there's "no real health problem with the campus' aging plumbing." But everyone should stop and think about what it means for water to meet just the minimum EPA standard, and the full scope of that statement. It's well known that the EPA has established minimum standards for relatively few of the thousands of chemicals found in the environment. And the minimums are based as much on what is economically feasible for local water authorities to remove from the water as it is what actually is healthy for you. Zero or close to it seems like a better minimum level. Bottom line: Don't drink water you don't know is safe. How can you know for certain? Before you drink it, filter the water yourself using a reliable water filter that has been tested and proven effective by NSF International. Anything else is just gambling with your health and the health of your family. You can read more at http://www.dailybulletin.com/news/ci_22913050/county-chino-highs-water-is-safe-drink. How Safe Are Water Disinfection Chemicals? If you live in or near a city, very likely you are on "city water." That is, your water is treated and disinfected at a central location and then distributed to homes and businesses. The principal tools central water authorities use to disinfect water are chlorine and chloramine. But do you know the health trade-offs that are at stake for you and your family? A recent article published by the Environmental Working Group titled "Water Treatment Contaminants: Forgotten Toxics in American Water" is a must-read. The article goes into detail explaining the compromises water authorities must make in choosing a disinfection solution -- compromises that affect your health. As always, the solution for you to mitigate the risks is to use a high quality drinking water filter at the point of use. You can find the EWG article at http://www.ewg.org/research/water-treatment-contaminants. This week there was noteworthy news from California, more specifically from Terminal 6 in LAX airport. During a maintenance operation, potable and non-potable water lines were crossed, sending polluted water to every point in the Terminal. Water fountains, restaurants and everything else down the line suddenly was serving up contaminated water to unwitting thirsty travelers. The problem has since been corrected, but what about the poor souls that were affected before the problem was noticed? Was that you? It could have been. We simply never know when an accident will happen or a human error will occur that affects the quality of our drinking water. That's equally true at home or on the road. The simple solution that you can implement is to filter your tap water at home at the point of use with an effective water filter. Away from home, you can carry filtered tap water with you in a suitable water bottle. When it's not possible to carry filtered water with you, like when you pass through airport security, you still can carry an empty water bottle with you that has a built-in filter, such as the Multipure wriggle. Bottled water may seem like a good solution when traveling, but everyone needs to be mindful of the increasing cost to the environment as the empty plastic bottle disposal problem continues to grow exponentially. You either can use a water filter or you become the filter! Choose wisely. Water2Drink is very pleased to be recognized by Multipure as the Sales Person of the Year for 2012. This recognition is annually bestowed upon the Multipure Distributor that made the greatest number of sales of Multipure Drinking Water Systems during the past year. This is the sixth time Water2Drink has won this recognition, having also won it in 2006, 2007, 2008, 2009 and 2010 – 6 out of the past 7 years! Water2Drink is proud to receive this recognition. We ascribe our success to the high quality of our web site, www.Water2Drink.com, to our commitment to offering our customers the best value, and to our superior customer service that focuses on helping customers buy what they need, rather than just selling a product. Thanks to our many loyal customers who have helped Water2Drink win this special recognition. Multipure products have been recognized by the leading Consumer products reviewing organizations as best in class. Water2Drink exclusively represents and sells Multipure products because of Multipure's continuing commitment to product quality, integrity, and customer service. What are the top rated water filters? That depends on who you trust. If you trust Consumer Reports, in November 2011 they published a review of home water filters and offer buying tips and advice. Initially, the information is only available to Consumer Reports Online subscribers, but it very likely will be presented in an upcoming issue of their monthly magazine. Check it out, and learn how to save money while protecting your family's health. Environmental Health Perspectives, a monthly publication of peer-reviewed research, recently published an article concerning the effect of Arsenic in lung development. The article describes research findings indicating that in utero exposure to arsenic via drinking water increases the risk of lower respiratory tract infections during infancy and mortality from bronchiectasis in early adulthood. Is fracking really safe? Do you feel comfortable you know how it affects ground water aquifers? The Obama administration issued the framework for a long-term study on whether fracking fornatural gas pollutes drinking water, but will not make conclusions until 2014 about the controversial technique that is helping to fuel a domestic drilling boom. What will our grandchildren drink if there is no water? Groundwater is a precious and finite resource, and we need to learn to use it more wisely. Studies show that we are depleting underground aquifers and will run out of groundwater unless steps are taken to change usage patterns. Everyone needs to understand the problem and begin addressing the problem while we still can.